I hope you’ve been enjoying my new series of posts all about speed. I started releasing them last week. More will be on the way this week to help you get a grip on all the things that are slowing down your site load time. Thanks to everyone who jumped in to take advantage of a hole in my schedule to get your site audit and/or HTTPS conversion started. This past week I’ve been going to town on them!! And y’all are staying right on top of the project, and I appreciate that so much. Last week my Webmaster Training peeps and I had a super live chat. Their feedback was invaluable to help us determine what types of live workshops and tutorials would be most helpful to learn about speeding up sites. Today, we’re doing our first workshop on conducting a site audit. I’ve done this type of workshop in the past, but of course I’ve added more stuff to what I check for speed, and we have several new Webmasters in the course since I did the last one too. We’ll also be doing group sessions to look at site audits from Webmasters and helping them determine what’s good, bad, and ugly, as each site and each hosting account will be different. We’ll be holding these workshops weekly, or as needed, depending on the questions folks have. The reason is, there is no substitute for experience with these things and questions are going to come up as folks encounter different things. Down the road we’ll be doing specific comparisons on sites using theme builders to see if there is any way to speed them up more, and just how much drag they put on a site compared to using Genesis themes, which are super clean and fast. I can tell you that adding elements like Font Awesome is a major speed drag and I can’t wait to get BlogAid’s theme revamped to take it out. So, speed is definitely something that all designers need to learn more about because that will be a big request from savvy site owners, which are the best kinds of clients to have!! In last week’s Tips Tuesday I reported about Google’s surge of interest in How to answers for Google Assistant. They are looking to monetize it and are seeking brand creators for it. That’s a huge clue about where Google is going with how-to content for Featured Snippets and Voice Search too. Yoast just came out with a reminder post that HowTo schema markup was introduced last year, but there is little to no support for it still. I bet that’s about to change!! It’s sort of like the same markup recipe plugins provide, but for how-to articles. I wouldn’t suggest manually doing this sort of markup at this point. And I’m hoping to get in touch with a few plugin devs to see if this is something they can put on their radar this year. I’m keeping my eye on it, and you should too!! I was pretty tickled to see this change to Google search. Now the Featured Snippets area expands to a drop-down with more choices. And so far, they’re all from different sites on most searches. And some are even best guess at related search. So, that gives more of us a chance to get into Featured Snippets, which is super!!! DIY SEO course members, be sure to watch the replay again on the workshop we did for special formatting to help you get more of your content into Featured Snippets and Voice Search. Folks, I’m going to do the best I can to pass along the GDPR tips that I find helpful. But, I’m a little overwhelmed with figuring out exactly what I need to do for BlogAid too. And, I’m not a cyber lawyer. So, please do read everything you can about it on your own to figure out what you need to do for your site too. If you haven’t gotten an email from Google Analytics about Data Retention yet, you soon will. Their new policies go into effect on May 25, the same day as the GDPR. Basically, they want you to select how long you retain the analytics data. The choices range in year increments, plus 2 months. So, 14, 26, 38, and 50 months. Or, you can choose not to expire them. The link above has instructions at the bottom for how to check your settings. It’s quiet easy. I found my data retention settings were all set to 26 months, which is as long as I think is relevant for BlogAid. So, I had nothing to change. But you’ll want to check yours too. I want to thank site audit client Kim Wende for posting a neat plugin in our exclusive Facebook group. It’s a Cookiebot plugin that helps you with both cookie alerts and spells out which ones are in play so you have transparency on your site, in compliance with GDPR. Your visitors can opt out of any of them too. Now, I haven’t checked this plugin, and the one thing that concerns me is how much it may chew up your database to do all that tracking by IP address. That’s a big concern for heavily trafficked sites. Plus, folks who visit on a hard wired connection vs mobile wi-fi or 3G or such, are going to have different IP addresses. So, you could be carrying double or triple info on the same person in your database too. I’ll check into as best as I can on one of my testing sites and keep tabs on the database. But not sure I’ll have time to slip that into my schedule prior to May 25, though. We’ll see. I always take clients through a live setup of Cloudflare so they know about all of the protection they are getting and how Cloudflare is in the middle of things now. The other day I guided a client through setting up the Web Application Firewall (WAF) in the Pro plan and there are bunches of new rules. There’s now protection for both XSS (Cross Site Scripting) and SQL injections, which are on the database. Those are the 2 most common security vulnerabilities in plugins, themes, and even WP itself. Seems like everytime a dev cleans up the code to patch one of those, a new one pops up. And that kind of fix is what’s in about half of the updates you do. It really is that common. So, I’m thrilled to know that the Pro plan on Cloudflare is helping protect my site in between that vulnerability being found and it being patched!! If you’re a site audit client and want to step up to the Pro plan, holler at me and we’ll do a quick live session to get it configured for you. Will take us about 10 minutes. This past week I project managed a client’s migration from HostMonster to SiteGround. And good thing too because there were all manner of issues on the HostMonster side of things. They are owned by EIG, just like Bluehost, Hostgator, and about 50 more hosts. And they are this side of criminal in making it hard, or downright impossible for another host to migrate you for free. Thank goodness the client didn’t have her email running through the host. We were able to do a manual migration a different way, without access to FTP or even the cPanel backup. This is just one of the main reasons not to have your domain-related email going through your host. READ: Get Your Email Off Your Hosting for the other security and performance reasons I suggest you make other arrangements, and where to setup your email instead. While having your domain as the extension on your email, like @blogaid.net, is usually considered more professional, the trend I’m seeing is for site owners to use their domain as the front of a free Gmail account. Yes, you can do that now. MailChimp and other list servs have changed their rules so you can use something other than your domain extension, at least on smaller email lists. But, you’re going to run into trouble with that as your list grows. For one, you can’t get an spf or DKIM record for a non domain-related address. Those two things help you avoid your emails going into the spam box of your subscribers. You also have to jump through a bunch of hoops to spoof your email extension on your site. If you use something like a comment reply notification plugin, those emails are sent via your host, and using the email address you have in your default WP settings. It is so worth paying a piddly $2-$5/mo to get a pro email account via Rackspace, or GoDaddy, or GSuites to avoid all that and get your emails into more inboxes. If you’re using a free Gmail account now and want to move to a GSuites account, which is the pro version of Gmail, it’s pretty easy to backup your current inbox to that new account. See this post from Labnol for the how-to. I don’t know if anyone has properly defined the next generation of the Web, but this is how I see it. Hard screens will be a thing of the past. Keyboards will give way to virtual touch and voice commands. Content will be placed by type where we want to see it, regardless of site design layout. Gutenberg is the way that WordPress is going to play its part in making this our reality. Torque has a post with a vision of how to get your content ready for this change. And I believe this reality is already upon us and will take off faster than cell phones did. In fact, I’m helping folks in my DIY SEO course https://learn.blogaid.net start to make this content transition now. They are revamping current content, and writing new content, with a focus to make it into a Google Featured Snippet. And that will also get them into Voice Search. And THAT is the way everything is going. You can see last week’s Tips Tuesday for more on how much Google is now squarely focused on bolstering Google Assistant as part of this grand leap into our online future. 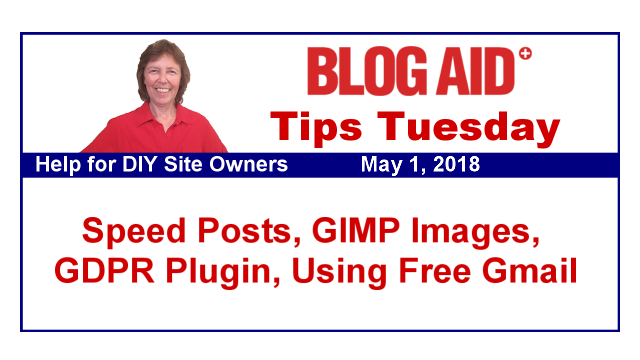 For those of you using the free GIMP program to create and/or optimize your site images, they’ve released a new version with tons of new features. One of the big changes in v2.10.0 is the way they handle the image optimization and processing. It has more color depth and is faster. So, be sure to upgrade and get your new goodies. Great post! I wonder if my gmail extension might be causing some of my emails to go in subscriber’s junk/spam. Thank’s for the tip going to look into the other email options. GDPR has me worried and I’ll sure appreciate any information you do offer if you find time. I’ll keep researching on my own too. Thank you for all you do MaAnna!! I believe any unverified email, that doesn’t have those extra records, has more chances to go into spam folders now. So, definitely worth getting them, even if you use a domain-related extension. Not all hosts output those records by default. Well, I think most do now, but if you set up your email years ago, you may not have them. You definitely don’t have them on a free Gmail account!! I have been exploring the issues relating to GDPR for my business for several months and have been checking out numerous solutions to ensure my site is compliant. Cookiebot is a good solution but be aware that the free soluton is only relevant if your site has less than 100 sub pages – so if you have a long standing site with a blog integrated you will probably need to look at their paid solutions. Thanks so much for that tip about the limit of pages on Cookiebot, Krishna!!! I ran the cookiebot analysis free report. I have around 522 posts. But the subpages are just over 1600. That put me out of the free program. Just saying before you decide know where you fall and be sure to use a checker!